How Much Do You Know About Thyroid Disease in Seniors? If you’ve never heard of the thyroid or don’t know what it does within the body, you aren’t alone. Most people don’t realize that this tiny gland located in the neck secretes hormones that affect metabolism. Thyroid disease is a common condition in aging adults, so if your elderly loved one has been feeling under the weather lately and demonstrated an array of unusual symptoms, the thyroid may be to blame. There are two forms of thyroid disease, and they both have to do with the amount of hormones that the thyroid gland produces. They are known as hypothyroidism and hyperthyroidism. Both trigger some unique symptoms that you, family members, friends, and senior care providers should learn about so that you can recognize when it might be time to see a doctor. Hypothyroidism occurs when the thyroid doesn’t produce enough hormones to keep the body running normally. This underproduction results in low metabolism and symptoms include weight gain, fatigue, constipation, puffy face, high cholesterol, dry hair and nails, muscle and joint stiffness, anxiety, and depression. Hypothyroidism is most common in women who are over 50 years old and those who might be suffering from autoimmune diseases. Hyperthyroidism is the opposite condition, as the thyroid produces too much of the necessary hormones. 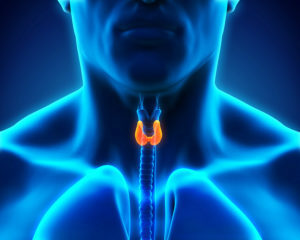 Recognizable symptoms of hyperthyroidism include weight loss, increased appetite, rapid heartbeat, muscle tremors, increased sweating, and an enlarged thyroid. Because so many of the symptoms are similar to other types of disease or age-related chronic illnesses, it’s not unusual for family caregivers and elderly adults to overlook the possibility of hyperthyroidism. Treating Thyroid Disease in Seniors. If you or other family members, or even the senior care provider, notice certain symptoms that seem to line up with thyroid disease, make sure to get the aging adult to the doctor soon. If left untreated, the aging adult could experience massive health problems. However, early detection and treatment can keep symptoms under control and slow the progression of the disease greatly. When treating hypothyroidism, doctors will prescribe a synthetic hormone to compensate for the underproduction. Hyperthyroidism is treated via medication that slows down hormone production. As with most diseases, a healthy lifestyle can make a big difference in the effects on the body. You and the senior care provider can encourage your aging loved one to eat nutritious meals, drink plenty of water, stop smoking, and get some exercise. With proper treatment and assistance from family caregivers and senior care providers, elderly adults with thyroid disease can manage the symptoms so they don’t interfere with normal life. When it comes to thyroid disease, recognizing symptoms and getting treatment is key to remaining happy and healthy for seniors.